Obduction is an adventure game hailing from Cyan, the same studio that produced the ’90s point-and-click classics Myst (1993) and Riven (1997). 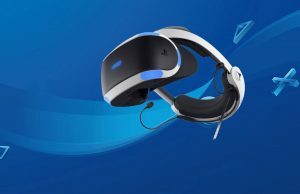 The game has been hotly awaited since it netted over $1.3 million on Kickstarter back in late 2013, but despite the fact that it’s officially launching on PC today, fans hoping to strap into a VR headset and start exploring will have to wait a little bit longer. 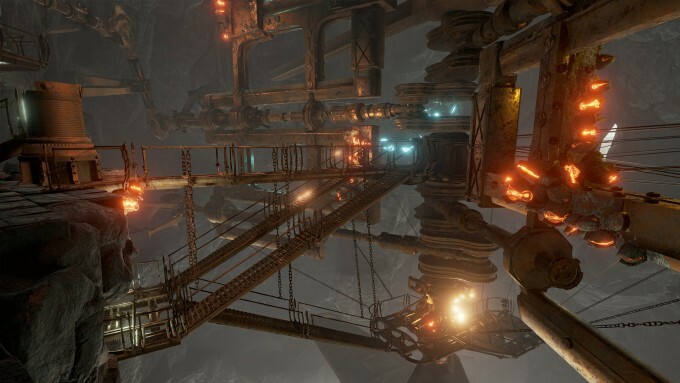 Cyan maintains the VR version of the game is ‘coming soon’, but that didn’t stop us from getting our hands on a so called ‘pre-release version’ for the Oculus Rift. 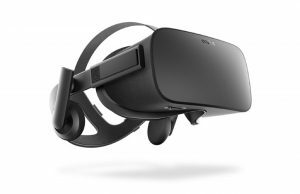 Update 03/24/2017: The long-awaited support for Oculus Touch and SteamVR Lighthouse controllers has finally been added to the game after many months. Because updating existing reviews is a near-impossible task due to continuous developer updates, both the following text and original scoring have been unmodified, even though the current implementation of hand controllers is decidedly substandard at the moment. You’ll find those impressions at the bottom. It’s been nearly two decades since I played Myst, but I still remember being entranced by the fidelity of the pre-rendered graphics, yet so disheartened by my inability to progress further in the game when I was stumped. Now that I’m older and have many more games under my belt, finding the determination to grind forward isn’t as hard as it used to be, but the puzzles are anything but easy. Hardly anything is ever handed to you in Obduction, so no easy number sequences conveniently scrawled on the side of the wall near a number door lock. Even a character named C.W. who acts as a sort of quest guide is only willing to give you general directions, and not really much else to go on. Much like Obduction‘s spiritual forebears, you start the game as a victim of a supernatural catastrophe, an abduction by an organic-looking entity that spirits you away to a strange and wonderful world. Foot planted firmly in the barren township of Hunrath, you explore a mysterious and impossible place filled with mishmashes of eerily familiar architectural styles and littered with holograms welcoming you to the not-so-bustling town. All of it is flanked by an encroaching alien environment filled with purple mountains jutting at crazy angles and forming seemingly organic shapes, an exterior weirdness held firmly at bay by a large red laser emitter. For the sake of minimal spoilers, I’ll say that there are an additional two three main areas beyond Hunrath to pound your head against on your search to escape the alien world. Besides the intensity of the visuals and the massive physical scale afforded by the headset, what stuck me was the density of puzzles splayed out before me. Mine cart tracks crisscrossed the whole map, and the telltale signs of Myst-style object interaction were everywhere. Mechanical contraptions, power lines, and multiple map levels all seemed so close, yet were removed by multiple challenges, each of them warranting a keen eye and plenty of time to examine. That said, the maps are pretty huge, and feature a number of smaller pathways to stumble across. 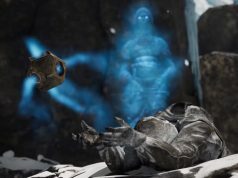 Live-action characters help fill out the overall barren look of the world, which is done mostly with pre-recorded holograms. A character played by Cyan co-founder Rand Miller, known for his role as Atrus in Riven, also makes an appearance. 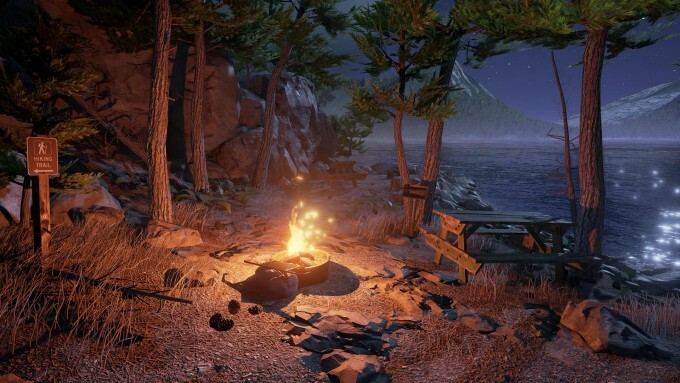 Playing Obduction personally took me nine hours to complete, however Cyan told us back at E3 when we got our hands on a demo the first time that anywhere between 5-15 hours are to be expected. Note 24/08/2016: I was told the version I played on the Rift was considered a ‘pre-release’ version, despite it being the full game. 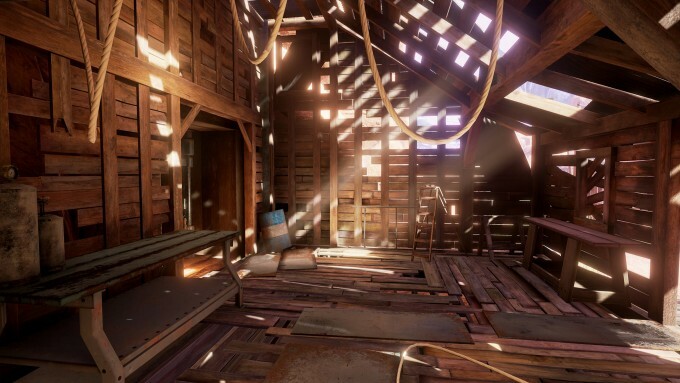 The environment in Obduction is nothing short of gorgeous, but this does come with a price. Graphically intensive scenes like the world’s giant machines chugging along at breakneck pace might trip you up depending on the guts in your rig. In fact, the minimum suggested card for Obduction exceeds the Rift’s GTX 970 recommended system spec GPU, asking for at least a GTX 980 and 16 GB of RAM at your disposal. For those playing the game with a rig below the game’s own minimum spec, thankfully you’ll be provided with several menu sliders so you can dial down things such as textures, shadows, anti-aliasing, and even modify the sampling level, enough to get things running smoothly. While under spec GPUs are most certainly to give frame rate issues and prove to be an absolute immersion breaker in VR, one thing I didn’t expect were issues with object interaction. I had several moments when touching a simple button was harder than the puzzle itself. Since your cursor is rendered in both eyes at a fixed distance of maybe a meter away, closer objects that require fine motor skills like rotary phones and switchboards are barely usable due to the cursor not converging correctly on the near-field object. My last gripe with the ‘pre-release version’ I played was the lack of inventory or notepad so you can easily hold clues for that cross-map puzzle dash. Several times I had to prop up my headset, grab a pencil, and write down a string of numbers or general mission objectives IRL so I didn’t forget. 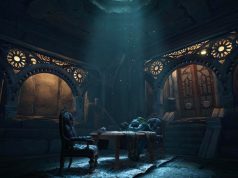 And when you’re in a world that ridiculously good-looking and immersive as Obduction is, you don’t want to fumble with anything more than the puzzle at hand. Getting around is mostly comfortable, considering there are two options in the menu: either hotspot-based teleportation, or smooth forward movement with 90 degree snap turn. There are times however when hotspots just aren’t in convenient places, and you need to switch in and out of the two modes to maneuver around an obstacle or cut a straight path through the map, a particularly annoying occurrence when you just need to get around. There is a standing and seated option, but I found myself much more comfortable seated with a gamepad than standing (given the lack of hand controllers currently), and used my swivel chair when I wanted to get a better look at the monolithic structures of the world. While the blink mode brings back some of the point-and-click magic of the old days, in a perfect world I would rather have Vive-style teleportation, a real ‘point and click’ with motion controls. 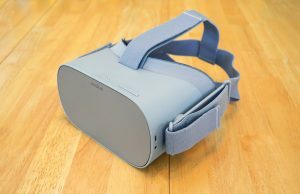 Seeing that it’s not an option on Rift currently, I can’t really knock the game on this regarding comfort. Vehicle movement is by far the least appealing part of Obduction. A powered minecart and later a tram were fairly tame if you’ve been around VR artificial locomotion for a while now, but it can feel lurchy at times for newcomers, of course keeping in mind that both immersion and comfort issues could be tweaked by the full release of the VR version. On the whole, Obduction actually does live up to the hype. It was a refreshing dive back into a classic that captured the same air of wonder I felt back then, especially when tinged with the frustration of having to backtrack to previous areas to collect a browsed-over clue. This, to me, isn’t a con though. It’s a feature that begs your attention, demands your critical thinking skills, and punishes you for not trying your best. Updating scores to games, whether it be raising or lowering them, sets a precedent that we don’t want to follow. It says to the developer that we are willing and able to go back and change our impressions to fit whatever update they consider worthy of a few more points at any moment after launch. 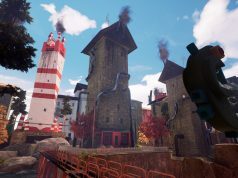 In Obduction’s case though—if we actually did that—I would probably lower the score to reflect the currently poor integration of motion controls and level of VR optimization. I won’t be lowering or raising any scores however, because I firmly believe that ‘what you get is what you get’ at the time of initial review with little exception. This too is a ‘what you get is what you get’ moment, where I will be listing my grievances with the full knowledge that updates are likely to follow. I do this because the studio is both advertising motion control support as a non-beta feature (“full motion control support”) and selling the game for money in its current form. If you don’t own it already, then this is the studio’s big push to win you over with new features and get your $29.99, whether it be on Steam or Oculus Home. I’m sad to say the long wait for motion controller support has not been worth it—not in its current form at least, and that you should hold onto your money until they fix the game, especially if you’re looking for something with adequate motion controller support. It all starts with diminished hand presence. The HTC Vive controllers can only offer so much hand presence, or the illusion that your hands are actually in the game, and that just comes down to the controller’s button layout. Vive controllers on principle seem to provide adequate hand presence once you’ve actually gripped a mobile object, but this is usually never the case in Obduction. When your hands look ‘frozen’ while using a Vive, it’s mostly par for the course. Oculus Touch however provides a number of variable finger positions, including full-handed grips, pointer finger and thumb extensions. Seeing a flat and frozen hand while using Touch is about as alien as Hunrath. The hand mesh used is both massive and way out of the correct position of where it should be. This is all pretty off-putting, but interacting with the world is an even greater challenge. Once you get to a lever or door handle and try to open it naturally, your hand then follows a pre-set opening animation which entirely disconnects you from the sense that these are actually your hands, instead making you puppet them to open or activate whatever it is you need to. So not only are your hands unnatural in form and function, but the world around you is mostly ineffectual. Performance has been an issue too it seems. My computer has an Intel Core i7-6700K running at 4.00 GHz, an NVIDIA GTX 1080 graphics card, and 16 GB of ram—well above the recommended specs for the game—and jumping into Obduction I was given a mix of custom graphics settings supposedly matched to meet my systems requirements to get a solid 90 fps. Everything seemed great at the beginning. But after messing with the settings to see what each one looked like, I started noticing dropped frames evidenced by asynchronous spacewarp reprojection similar to what reddit user kommutator reports. This resulted in stuttery hands and sort of ‘melty’ look to objects even on medium settings, not something I’d expect considering my setup. Putting up a frame rate counter via NVIDIA’s own screen capture software, I found that even on the lowest setting I was dipping into the mid ’80s fps-wise. 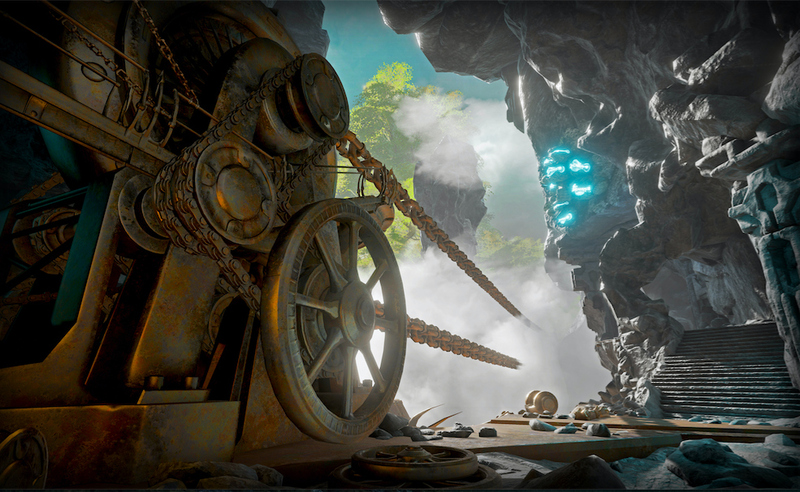 This isn’t exactly the focus of my revistation of the Obduction review, but there are a few updates outside of motion controller support that make the game more appealing to a larger VR audience. The user now has the option between node-based teleportation, user-guided teleportation and smooth turning along with the stock snap-turn ‘comfort mode’. Since any and all of these issues mentioned could be resolved in successive updates, you should keep an eye on the game’s Steam page for more info. 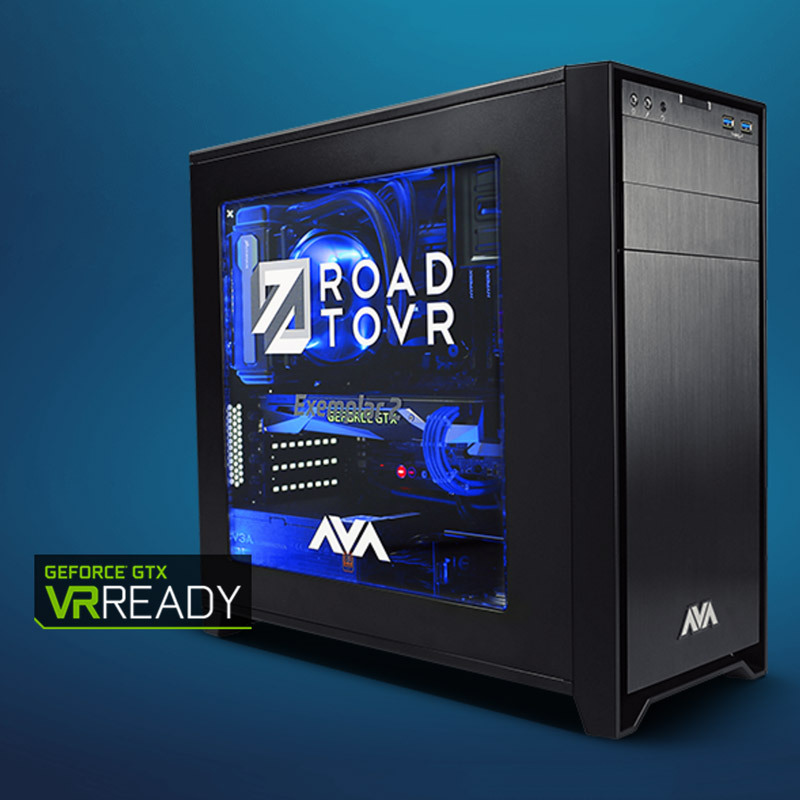 We partnered with AVA Direct to create the Exemplar 2 Ultimate, our high-end VR hardware reference point against which we perform our tests and reviews. 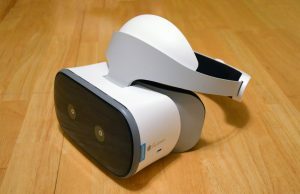 Exemplar 2 is designed to push virtual reality experiences above and beyond what’s possible with systems built to lesser recommended VR specifications. 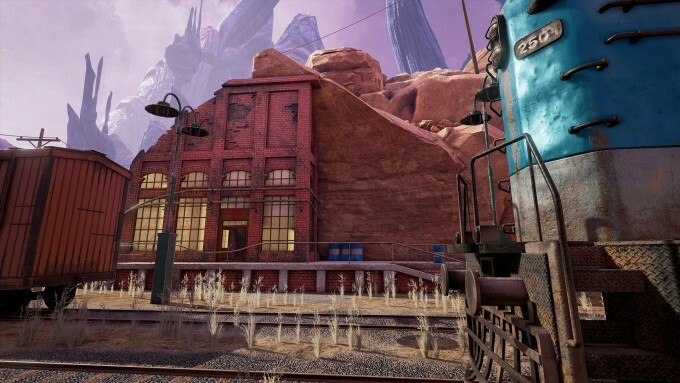 'Obduction' revives the overall feeling of its predecessors 'Myst' and 'Riven' by recreating the familiar brand of visually stunning environments mixed with cerebral puzzles. 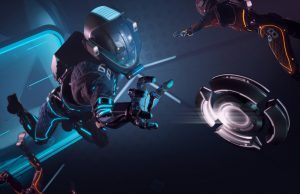 Some object interaction is still in need of TLC, but Cyan vows to right all wrongs before launch of the VR version 'coming soon'. Infuriating. Reviewing a flat as a pancake game… no sign of VR version. “coming soon”… Why review the flat pancake version? That’s good news isn’t it. 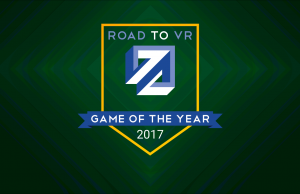 @Ian Shook:disqus is correct, we reviewed the VR version of the game which the company says will launch soon. Could you reach out to Cyan and ask why we won’t have smooth motion available as an option? I really hate teleporting and snap turning. Smooth forward with 90 degree snap turn… ugh. Awful. Just give us option for smooth movement in any direction and option for teleport for those who spew very easily. I played another VR game with that snap turning and it’s so ugly and disorienting. I have no problem with smooth movement in any direction. I was in my element with HL2 and TF2 in VR. I agree, I’d be interested if they had the full movement option. The days of HL2 VR on the early Rift kits, loved them, spending hours in that game is what gave me my VR ‘legs’ I think. Same experience. I understand that lots of people get sick in experiences with full motion, but I’m not one of them and I find these 90 degree turn and teleport around options immersion breaking. I just don’t like them. As I recall… IO Moon has the most complete set of options… Let’s you choose full motion or snapping or teleport. I like the vanishing of ethan carter because it’s one of the few VR games to provide full motion as well. Options. Options Options. There is no single holy grail solution. I for example like snap turning, but only in 45 degree increments. Just give people the options and everyone is happy. Get it straight VR devs! I absolutely will not tolerate “teleport” or “snap turning” of any kind. 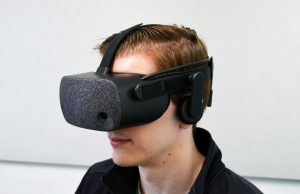 As options, that’s great for people who like those systems… but since I’ve been gobbling up VR for years now I need an option that gives me complete control. Anything less than full, natural FPS controls (see Half-Life 2 VR or A:I VR) is an automatic and non-negotiable no-go for me. I can certainly understand that. I wish hl2 still worked in vr. I saw some nausea clan members gloating on a forum about the fact that it no longer worked in vr. They were saying it never should have had vr in the first place. I wanted to punch their faces. I’m essentially a nausea clan member and HL2VR (with Hydras) was one of the best VR experiences I’ve had. Survived it by closing one or both eyes while turning, etc. Interesting. Well done on pushing through. Does the nausea remain the same now? It was much worse at first and did improve, but it seems like there’s a limit to improvement and it hasn’t changed much since the first few weeks. I’m mostly fine with smoothly moving forwards in games and can manage other motion for a while, but smooth rotation still makes me sick within a relatively short time. Ideally if I can just turn my body in real life that solves the problem, but otherwise (e.g. <360 degree setups like PSVR with Move controllers) snap turning is useful for me. Please, tell me how you played HL2 in VR. I have both the Rift and the Vive, and the “Virtual Reality Mode” option just says “No display detected”. When you run hl2 you should get it displaying on your vive. For many there is judder on head movement but this depends on system and on the graphics settings of the game. Snap-turns using the Remote are 30 degrees, only. What about Vive support? What about building in touch manipulation of game objects? 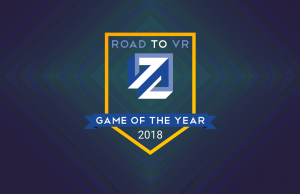 This game uses gaze based selection and button pushing interaction, the least common denominator of VR interaction used by lazy developers everywhere. I sure hope they improve these aspects for a Vive release or I won’t be buying. What games have you developed recently? 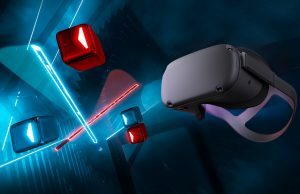 Simply put, motion controllers for VR adventure games seems like a no brainer, and it’s kind of surprising the devs didn’t put it in. This clearly got some of that Facebook money to be a rift-only title (for now), but once the Rift’s Touch controllers come out, games like this will be quickly ignored in favor of ones that you can physically grab items. Controller-based games make sense for cockpit-based games and third person (like Lucky’s Tale). First person games where your avatar is presumably walking around picking things up, while you’re sitting down using a controller, feel wrong, especially after having used motion controls for other similar games. Even a quick-n-dirty implementation works fine, look at Vanishing Realms. Precision is absolutely not required for the puzzles, getting a key item near its intended place snaps it in. Zero people complained about it. This is simply a game retrofitted for VR, not built with it in mind. If it controls better on a 2D screen, using controls intended for a 2D screen, then that’s where it should be played. 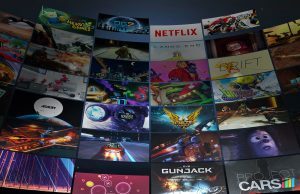 Sounds like they are devoting extra resources and delaying vr release to improve quality. Most room scale games are more like tech demos than full releases hopefully with time that will change. They could very well add motion controllers later to update the experience like the climb is doing for the touch. 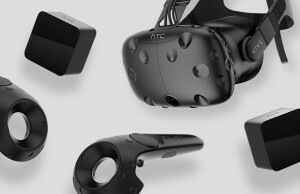 They have stated that they’re developing a Vive version designed for motion controllers. What kind of stupid response is that? You are complaining about lazy developers why don’t you go any make a better game then that supports they controls you want. Just saying? Oh and you wiki applies to you too just because other developers are using touch controllers doesn’t make cyan lazy because they don’t. 2. You genuinely want to know why I don’t go and make a better game. In that case, the answer is quite simple: I don’t want to. My life is too full already to make room for a multi-month/multi-year effort like that. This is completely unrelated to the fact that the Obduction VR support is lame, of course. Now, your second paragraph is a different logical fallacy. It’s called “Straw Man”. You are arguing against a point that I never made, because it’s an easier argument for you to win. I never said that cyan is lazy because other developers are using touch controllers. I said cyan is lazy because they don’t use touch controllers when that’s clearly the better solution. 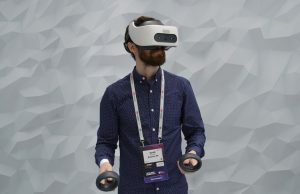 I also said that this is a common way for lazy developers to implement VR controls, treating the game mostly like a 2d game wrapped around your field of view. What it sounds like to me, is that you actually agree with me. Their VR implementation is lame and lazy in this game. What you don’t like is the fact that I would criticize them for it. Well, I feel a need to criticize companies that do this, loudly and often, because I want them to know, and I want everyone else who would influence their decision, such as people who might buy their product, to know, that this type of lazy development is not good enough for the particular game in question, but in a broader sense, is bad for the industry, because it’s demonstrating a version of VR that is less than it should be to convince others to become early adopters. If all of that is true, then I will gladly retract my opinion of this game and its developers. Only time will tell on that front however. Wow, you have too much time on your hands… I don’t agree with you because I haven’t played it yet. Nah, I’m just a fast thinker and fast typer. Believe it or not, I can formulate thoughts that take more than one sentence to express. You should try it sometime. Don’t need to say much sometimes checkout this link. Mommy! Someone criticized a game developer on the internet! Frowny face. At least play the game before complaining about it. If you don’t want to play it why bother whining a out it. It’s like saying you don’t like broccoli even tho you never tasted it. Gamers express what they like and don’t like. Devs listen and make changes to please gamers. You can influence the state of a game, but you can’t change broccoli. 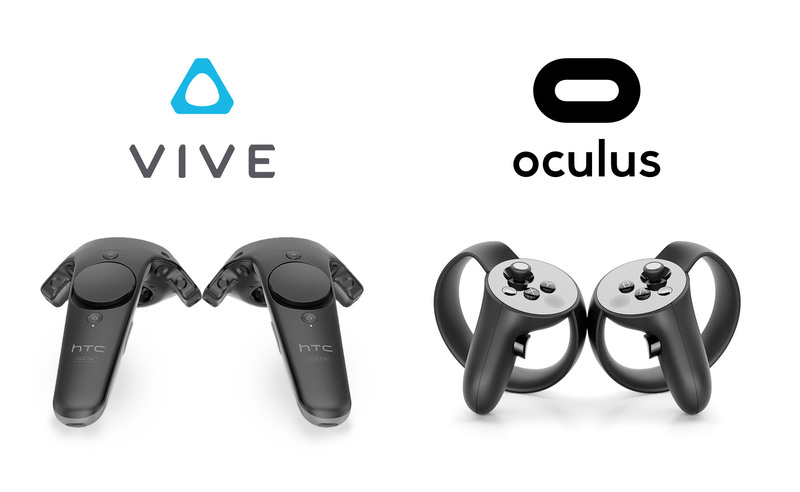 They’ve stated that they’re working on a Vive version centered around motion controllers. I hope you are right, and I will gladly eat my words if you are. 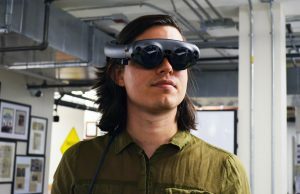 Considering that the HUD peripherals are about the same between the Rift and Vive, there’s no reason to be delaying a Vive release six months unless they’re fine tuning puzzles and controls for the Vive. Just my thoughts on it. Oh did they say they’re delaying it six months? That’s what my significant other told me, so I don’t have a source on that time frame. I asked about it and apparently the interview said the Vive version would be “a few months after the Rift release”. Interesting. Well I’d rather wait 6 months than play the Oculus version through Re-Vive without motion controls. It looks great but no doubt this game will be premium priced (say $50?) so only 5-15 hours of gameplay just isn’t nearly enough. probably looking forward to playing this game on the Rift more than any game right now. Waiting for rift with touch controls before buying rift or this game. Just one tiny correction…unless I’m just not far enough in the game. I have yet to see Rand play a character in Obduction, but his brother Robyn (Sirrus, in Myst) is the man bunkered down behind the door. You’re right that Rand played Atrus, as well as Achenar, but I haven’t yet seen him in this one, but you’ve got my hopes up if youve really seen him play a different character! so, can you play this game on an Oculus rift with a gtx 970 if you turn the graphics settings down? I saw the 980 requirement and was kind of shocked. 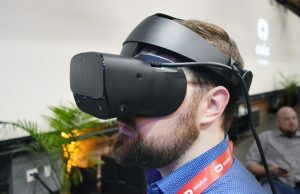 We weren’t supposed to be seeing anything above a 970 minimum requirement for at least 2 years after the oculus was released. This is a major issue for VR if games start doing this. You have to at least give people 2 years to enjoy their hardware before having to upgrade. 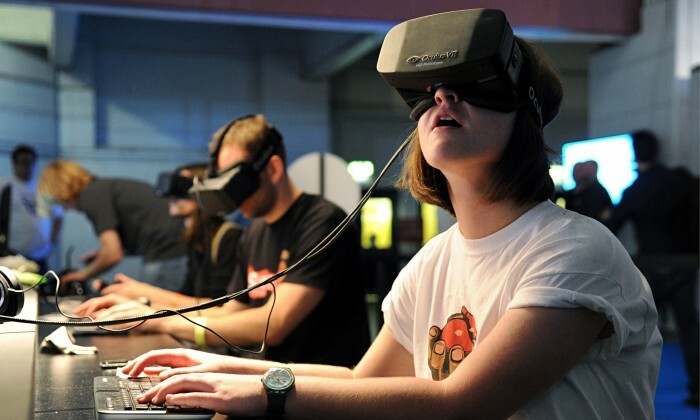 There’s a reason why Oculus has been pushing the game developers not to exceed a 970 minimum requirement. A game as big as one that tops an entire genre like something from the creators of myst not meeting this 970 minimum is even worse. This better work with lowered in game settings. If not, the developers should open up more settings in the in game menu to allow people to get around issues while running it on a lower card. According to latest Kickstarter update, they’re adding smooth turn ASAP as a hotfix. Well I waited this long for Touch support on this game. . I will now have to wait longer for the bugs to be worked out. . and I guess until next winter when I upgrade my video card. . since it seems to be pushing even GTX 1080 to the limit. Hopefully by then it will be on the Winter sales list. A bit disappointed that the Vive integration took so long, and doesn’t seem to work very well :( But maybe it’s overlookable considering the game is supposed to be pretty good? 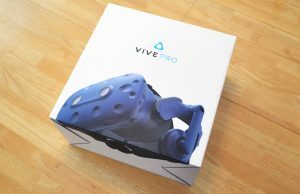 :-/ I was patiently waiting for Vive integration, but now reading this, am back on the fence.